We Have Cracked the Foundrae Code! Generally speaking, charms have a pretty straight forward message. For example, a four leaf clover equals good luck. This type of jewelry goes back eons. 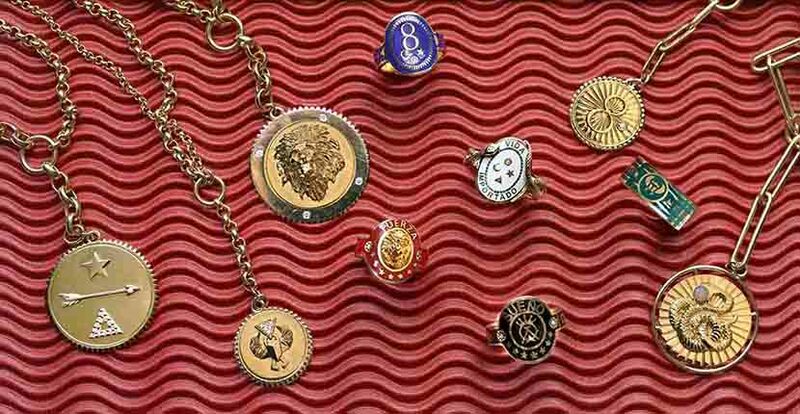 During the nineteenth century, Queen Victoria is credited with igniting the trend for charm bracelets, after Prince Albert gave her one with a collection of enamel hearts. 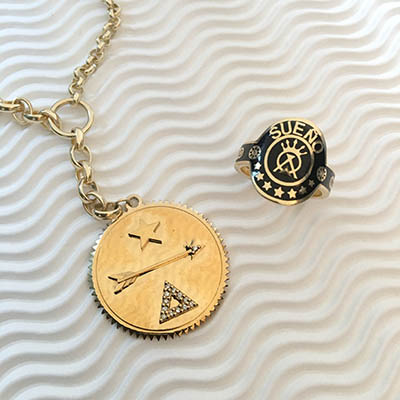 Today, the symbolic jewelry trend is going strong. There are any number of stars, Italian horns, evil eyes and what not available to provide the wearer with good luck. There is nothing, however, quite like the complicated amulets Beth Bugdaycay has created for Foundrae. The multiple ancient motifs on each of the five ‘Chapters’ of the collection—Strength, Karma, Dream, Protection and Wholeness—require a bit of interpretation (see the guide below). Well, actually, more than a bit of interpretation. Every time Beth begins to review things, I get visions of Tom Hanks playing Symbologist, Robert Langdon from the Da Vinci Code. In other words, Foundrae’s symbols have layers of meaning and roots in history. Oh, and there is also a little Spanish in the mix. Beth learned the language growing up in Brownsville, Texas, a town near the Mexican border. From the moment the line launched in the spring of 2016, it was embraced by women in search of a new type of talisman. One of the first high profile stars spotted in a Foundrae jewel was Kirsten Stewart. 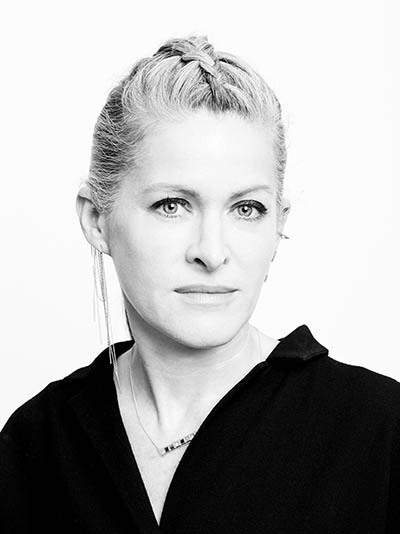 She was seen in a Strength necklace at the Cannes Film Festival and has worn it on several occasions since then. Rosie Huntington-Whiteley was photographed recently wearing one of the Wholeness Baby Medallion necklaces. With the depth of meaning Beth applies to the Foundrae designs, it is certain there will be a lot more sightings of women everywhere in her jewelry soon. 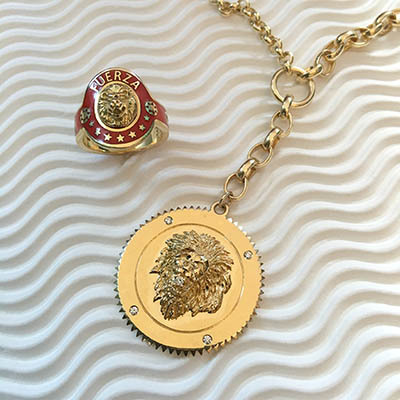 STRENGTH: The most prominent feature on the Strength designs is a sculpted lion. “The lion universally symbolizes dignity and prowess but at the same time they are family oriented and social animals,” explains Beth. The star stands for divine guidance and energy. “The star tempers the lion because pure strength without a path of divine guidance can be brutish. So the message here is strength within and the energy to move forward.” The red color of the enamel on the ring is another symbol of power. The word fuerza emblazoned across the top means strength in Spanish. 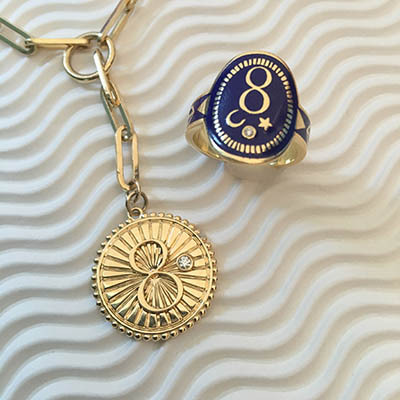 KARMA: The number 8 is the most prominent feature in the Karma ring. It represents cyclical energy. “For me it was just reminding yourself to make the choice to be part of positive energy every day,” says Beth. The crescent moon represents the Latin-Italian root of the verb crescere meaning to grow. “The idea with the moon is that every day is a new day for growth—every day to try and do your best,” says Beth. Energy to achieve your goals is in the star. The blue color is intended to bring a calming serenity. DREAM: The arrow on the dream pendant represents the actualization of dreams. “It’s asking yourself, what are your values and what is the next chapter?” explains Beth. The triangle has multiple meanings. “Throughout history, triangles have represented pyramids, arrowheads and sacred mountains,” explains Beth. 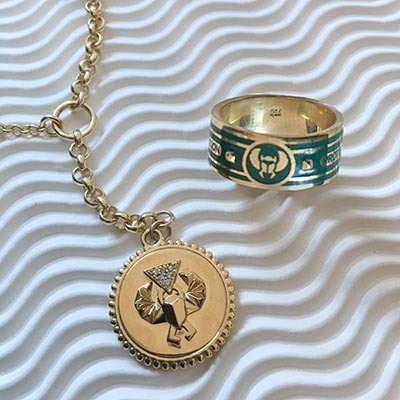 “All of these things are about introspection and change.” The crown within the triangle on the enamel cigar band is a motif Beth found on a vintage box. It represents the achievement of a dream. Sueño is the Spanish word for dream. The black represents the absence of color, a clean slate of sorts. PROTECTION: There is a scarab on the Protection collection. It is the ancient Egyptian symbol of Khepera, a form of the Sun-god Re who was a powerful protector. “The symbol shield us from our own negative thoughts that prevent us from using our energy to build more productive lives,” says Beth. The green color of the enamel on the band ring represents safety and it is intended to have a healing power. WHOLENESS: “The entire concept for the collection was based on wholeness, but this ring specifically focuses on it,” says Beth. The snake wrapping around the central plaque on the ring and in the center of pendant reflects the reptile’s ability to shed its skin and begin anew as a metaphor for rejuvenation. “Wholeness encourages the fulfillment of inner balance and growth,” says Beth. There are also symbols found on other designs in the collection on the Wholeness cigar band ring—the crescent moon, star and triangle. 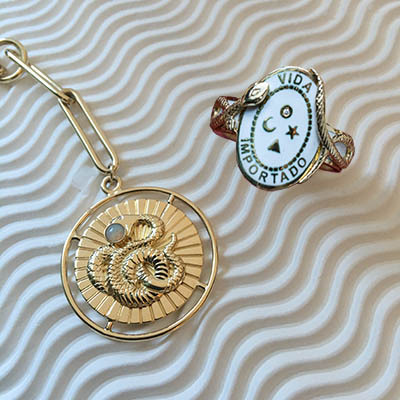 The Spanish words vida importadao appear on the cigar band ring as a reminder of the importance of our lives.